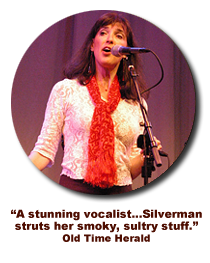 Dubbed a "stunning vocalist" by the Old Time Herald, Barbara Silverman has performed in concerts, festivals and workshops nationwide. She is known for her engaging presence, bluesy vocals, clever originals, solid swing guitar and piano accompaniment, and amazing washboard pyrotechnics. And she is recognized as a "master teacher." Performing solo or with the renowned Laketown Buskers jug band, Barbara appeared on A Prairie Home Companion, The Studs Terkel Show, award winning bands in West Virginia and Colorado, and festivals throughout the Midwest. She is also a founding member of The Teflons, a string band quintet that has taken the Midwest by storm with friey swing fiddle, tasteful mandolin and dobro, and lush 3-part harmony. Barbara has shared stages with Emmy Lou Harris, Bill Monroe, Odetta, Arlo Guthrie, Tom Paxton, Greg Brown, David Bromberg, Buffy St. Marie and more, and has seven recordings available on Vetco, Marimac and independent labels. These include Carry Me Home, Dance Around in Your Bones, Rolling Along, Live From Big Bay, Live on Radio, Into The Frying Pan, and Wrap Your Troubles. In arts education for twenty-five years, Barbara has led classes and workshops for Indiana University Northwest, Urban Gateways, The Discovery Center, North Park Elementary, and is a current faculty member in four departments at the reputable Old Town School of Folk Music. Through these years Barbara also created a process and a troupe called Life-Story Theatre which she has presented at local theatres, national and regional conferences for the American Society on Aging, universities, and health and wellness institutions. Click the image to download our high-quality images. "The group was a delight to behold. Standouts included Barbara Silverman, who sang wonderfully and carried around a washboard that she strummed with great flair. Moreover, her washboard was festooned with a variety of horns, cowbells, and other percussion objects that made her seem at times to be a veritable one-woman band." "some terrific sounds from a superb entertainer"
"Barbie, as always you put on a great show."